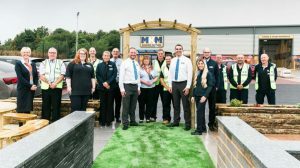 MKM Building Supplies has opened its third Lincolnshire branch, its 54th nationally, on the Fairfield Industrial Estate at Louth. Owned and developed by Taylor Lindsey, specifically for MKM’s occupation, the building is 12,500 sq ft and occupies a site of 1.9 acres. MKM is the UK’s largest independent builders merchants and the new store brings 16 jobs to Louth, including Branch Directors Mark Thomas and Guy Robinson. Taylor Lindsey’s Development Director, Dan Race, said: “We are very pleased to welcome MKM to our Louth development. We have further land for development adjacent and opposite the new site and we are confident that the arrival of MKM will attract other occupiers to the location shortly”.